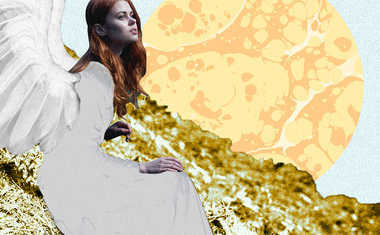 Virgo is represented by the Virgin in Astrology. 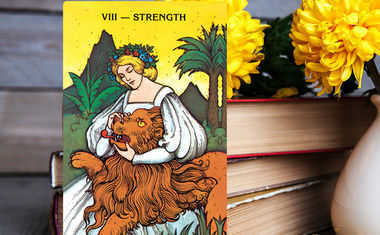 So how can a virgin be connected with the dreary Hermit Tarot card? 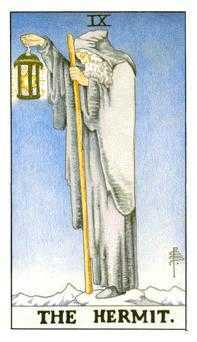 The complexity of the Hermit Tarot Card is unmistakeable -- here we have a solitary man draped in a long dreary grey cloak, pacing atop a desolate mountain. Similarly, Virgo, is the epitome of a person at complete fulfillment alone and to themselves, while always pondering perfection. Their stereotypical “virginity” is not literal -- most Virgo’s are seldom celibate. Instead their virginal nature is a representation of the sustained personal identity they keep throughout their entire lives. And actually, the astrological glyph for Virgo is thought to depict our sexual organs! 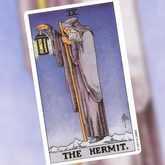 As you can see, there’s nothing sexual on the outset of the man in the Hermit card. This guy is on a different level… LITERALLY. At the peak of the mountaintop, his personal struggles have lead him to inward reflection and an uphill climb -- rising above any distractions and focusing on his mission. All Virgos out there can relate to this: as forever perfectionists, there’s nothing that will stop a Virgo from successfully reaching their goals. Want some enlightening words from the Hermit himself? Wisdom, like a flame to a candle, turns us into lanterns lit from within. Basically, the wisdom gained during times of solitude is meant to be shared with others! This wisdom is represented in the Hermit’s very special lantern - lit by a glowing star. This star is the Seal of Solomon which just so happens to symbolize wisdom. Of course a star filled lantern helps light the way, but how does this old man make his way up that treacherous snowy mountain? Not without the help of the Wizard Staff in his left hand! This represents guidance in lessons learned, a quality Virgos cherish.